Did the Zombies get revealed yet? Was excited, as soon as I saw that stupid exo boost jumping I writ it off. Screw that. Why do they only release one Call of Duty every year? This is surely the equivalent of the prestige pack eg the top tier which has always had the season pass. 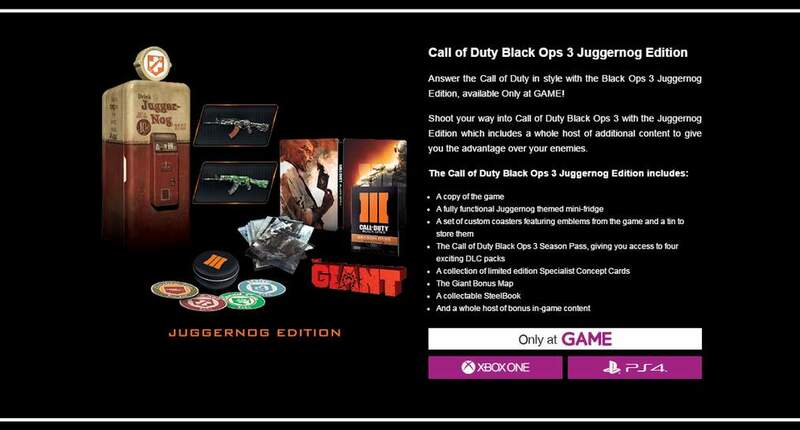 It's last years equivalent to the hardened edition that had the season pass removed. You'll get any fridge they find in their skip then. Tbh it does look interesting. It beats some collectors out there. I miss the days when collector editions had some funky object. Large statue, rc car, etc. Now a days it's just a stupid hard book with artwork, half a season content pass (destiny) and pathetic dlc bonuses, weapons and a health pack (evil within). It's nice to be out there at a good cost. Can't make something over the top and charge a price of a console on it (handsome jack collection). Shame it's not for me, but I welcome the outrageous collectors (at an acceptable price). If anybody could make a game as good as Cod 4 I reckon it would be an instant hit - I know I'd buy it. They doing an Eggnog edition seeing as it always launches close to xmas? No, but I see they are doing the rip off edition like the did last year, but this time at least they have the balls to call it the same as it's always been. E.g there is no season pass in the Hardened edition, well according to the game listing. 12 can mini fridge by all accounts. Down with GAME (not that I wanted one anyway but that is besides the point). I hate Game. My store overcharges on everything to the point where the buy 2, get 2 free offer was still expensive. The cost of their second hand consoles are like £300, a higher price then new consoles. Game must be retarded to think that $199.99 = £180 (it actually equals £130). $199.99 in the states.Down with GAME (not that I wanted one anyway but … $199.99 in the states.Down with GAME (not that I wanted one anyway but that is besides the point). 20% VAT and whatever import charges on top. I'm not suggesting people import one, heaven forbid. I'm talking about the price difference, even if you add VAT the US price works out to be about £150. selling on eBay for about £600 now!